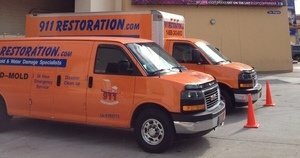 If your home experiences a leak in the middle of the night, you can call the water damage Warwick specialists at 911 Restoration of Westchester and they will be at your doorstep within 45 minutes. The Warwick office is available 24/7/365, so you know you can depend on us for assistance at all hours of the day and night, even on holidays. We are here to help you, and you can be sure that we will do all we can to get the job done correctly the first time around. Our Warwick flood cleanup experts offer same day services for all situations involving water, because we know the extent of the damage that moisture can inflict on your home and possessions the longer it sits. Call us today, and our Warwick water damage restoration agents will give you a free home inspection immediately upon arrival to get the process started. It is understandable that some area of your household are more susceptible than other parts to being damp and moist. This can be a problem for many reasons, with one major one being mold. When moisture sits on surfaces such as wood, cardboard, and drywall it can cause mold spores to flourish into an infestation. It is impossible to mold-proof your home, but it is possible to help make it mold-resistant. It is important to understand where are the problem areas in your home are. Whether it is the basement that is prone to flooding, a water stained ceiling or a window that always has condensation. Call the Warwick water emergency agents as soon as you discover any excessive moisture in your home and we will eradicate the mold and stop the leak, saving you money down the line. When you realize that you need to have your home completely renovated it can be an overwhelming situation. That is why the Warwick water cleanup pros are here. We make a seemingly difficult situation as easy as can be. With us on the job, not only can you be sure that we will get your home back into pristine condition, but we will also help you with the financial aspects of the process. Our Warwick flood removal crew knows exactly what insurance companies need to get you the best possible coverage. By letting us file your claim, we will greatly improve your chances of getting that financial aid you deserve. So, call our water damage Warwick flood extraction team, and we will make sure that you get affordable, competent services today!